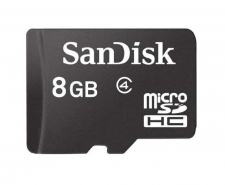 Not all devices support microSDHC™ memory cards. Contact your device manufacturer for details. ** Five-year warranty in regions not recognizing "limited" warranty. † Compatible device required. HD (1280x720) video support may vary based upon host device, file size, resolution, compression, bit rate, content, and other factors. See: www.sandisk.com/HD. ‡ Software download and installation required (download code included in insert).